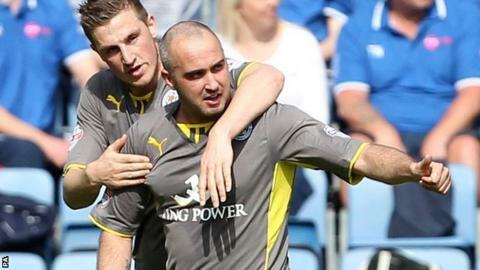 Leicester moved to within a point of the 100 mark in the Championship after a win at Huddersfield. Former Huddersfield forward Gary Taylor-Fletcher gave the champions the lead when he curled in a shot off the left-hand post. The home side went close when an Adam Hammill effort was cleared off the line but Leicester had the better chances of a low-key game. Wes Morgan tapped in a Matty James cross to wrap up the win for the Foxes. There was little riding on the match as Leicester had won the title at Bolton in midweek, while Huddersfield had secured Championship survival with a win at Yeovil last week. James had been denied by the woodwork before he helped set up the opener. He broke from deep and found Lloyd Dyer, who set up Taylor-Fletcher to finish the move with a stylish finish. The home side should have levelled when Sean Scannell cut the ball back for the unmarked Hammill, whose tame shot was cleared off the line. Huddersfield keeper Alex Smithies saved from Dyer, Chris Wood and Dean Hammond before Morgan's goal secured a Foxes win. "We were all right box to box but in the final third we didn't do enough. "Having said that we were playing the champions who look like a Premier League outfit now. "They have done unbelievably well." "The 100-point total has given the players something to focus on. "All we can do is keep playing well and hopefully reach the 100 or 102-point mark. "We have illustrated we have a really strong squad and are capable of still performing at this stage of the season." Match ends, Huddersfield Town 0, Leicester City 2. Second Half ends, Huddersfield Town 0, Leicester City 2. Corner, Huddersfield Town. Conceded by Liam Moore. Foul by Ignasi Miquel (Leicester City). Substitution, Leicester City. Daniel Drinkwater replaces Matthew James. Substitution, Leicester City. David Nugent replaces Chris Wood. Attempt blocked. Sean Scannell (Huddersfield Town) right footed shot from outside the box is blocked. Assisted by Anthony Gerrard. Ignasi Miquel (Leicester City) wins a free kick in the defensive half. Substitution, Huddersfield Town. Joe Lolley replaces Adam Hammill. Goal! Huddersfield Town 0, Leicester City 2. Wes Morgan (Leicester City) right footed shot from the centre of the box to the bottom left corner. Assisted by Matthew James with a cross following a set piece situation. Andy King (Leicester City) wins a free kick on the left wing. Lloyd Dyer (Leicester City) wins a free kick in the defensive half. Substitution, Leicester City. Riyad Mahrez replaces Gary Taylor-Fletcher. Substitution, Huddersfield Town. Oliver Norwood replaces Duane Holmes. Attempt blocked. Lloyd Dyer (Leicester City) left footed shot from the left side of the box is blocked. Assisted by Matthew James. Attempt missed. Dean Hammond (Leicester City) right footed shot from outside the box misses to the left. Assisted by Chris Wood. Attempt saved. Lloyd Dyer (Leicester City) right footed shot from the left side of the box is saved in the centre of the goal. Attempt missed. Adam Clayton (Huddersfield Town) right footed shot from outside the box misses to the left. Assisted by Anthony Gerrard. Attempt blocked. Adam Hammill (Huddersfield Town) right footed shot from outside the box is blocked. Assisted by Paul Dixon. Attempt saved. Lloyd Dyer (Leicester City) left footed shot from the left side of the box is saved in the bottom left corner. Assisted by Gary Taylor-Fletcher. Corner, Leicester City. Conceded by Anthony Gerrard. Attempt blocked. Chris Wood (Leicester City) left footed shot from the left side of the box is blocked. Assisted by Matthew James. Offside, Leicester City. Matthew James tries a through ball, but Chris Wood is caught offside. Attempt blocked. Adam Clayton (Huddersfield Town) right footed shot from outside the box is blocked. Peter Clarke (Huddersfield Town) wins a free kick in the attacking half. Second Half begins Huddersfield Town 0, Leicester City 1. First Half ends, Huddersfield Town 0, Leicester City 1. Attempt missed. Duane Holmes (Huddersfield Town) right footed shot from outside the box is too high. Assisted by Adam Hammill following a corner. Attempt blocked. Adam Hammill (Huddersfield Town) right footed shot from the centre of the box is blocked. Assisted by Sean Scannell with a cross.